Liverpool could lose its only air link to London because the current service is no longer viable. 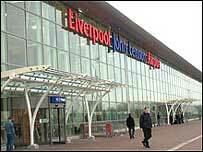 Belgian airline VLM is suspending its route between John Lennon Airport and London City from 1 July. The company said falling passenger numbers meant the service, which was recently scaled back to two flights a day, was "no longer sustainable". VLM said it was in negotiations with other airlines which had expressed interest in carrying on the route. Business leaders in Liverpool rely on the service, which was restored in 2004 after a huge campaign. At the time, business and tourism leaders said the link was essential to European Capital of Culture celebrations in 2008. However VLM's four daily flights were cut back to two a day earlier this year. Johan Vanneste, managing director of VLM Airlines, said he understood there would be disappointment, and thanked agencies in the city for their support of the service. But he added: "As an independent company which receives no subsidies, we have to ensure that all of our routes are commercially viable." Although the company is axing its flights, it said there would be no redundancies.